DrinkWire is Liquor.com’s showcase for the best articles, recipes and reviews from the web’s top writers and bloggers. In this post, American Juice Company interviews a cocktail legend. 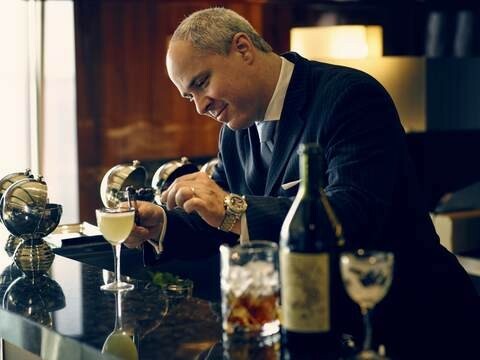 I have been called a Master Mixologist, Spirits Historian, Industry Influencer and Award Winning Cocktail Book Author. In 2008 I founded Creative Cocktail Consultants, a global beverage consulting firm dedicated to redesigning corporate beverage programs through cutting edge mixology, spirits education and Michelin beverage standards. My career started in 2004 when I accepted a job as the head barman in Chef Thomas Keller's Michelin three star restaurant Per Se. From there I worked for Diageo as their first ever Global Spirits Ambassador where I helped establish and judge their World Class Cocktail Competition. I've just finished my fifth cocktail book WhiskEy Cocktails available this fall. I have recently partnered with Seabourn Ultra Luxury Cruise Lines and have redesigned their entire bar program, along with Chef Thomas Keller who has partnered with them as well to reinvent their food menus. I am negotiating with Korin Japanese Steel and Baccarat Crystal to create a new line of luxury bar tools. I just finished a new episode of Bar Rescue on the Paramount Network which will air in July. I design all the cocktail menus with Geoffrey Zakarian from the Food Network for his restaurants. And I am moving from New York to Las Vegas to accept a new job as an executive director of mixology and spirits education with a major spirits company. However my most impressive project has been my one year old daughter who keeps me on my toes everyday! AJC's newest flavor in collaboration with myself is a Smokin' Margarita with Chipotle Chili Powder, Lime Juice, Agave Nectar and then your choice of 100% Agave Highland Tequila. If you want to add an additional layer of complexity, add a small splash of Mezcal as well. Serve on the rocks with a lime wedge... Delicious!! Once you understand the principles of flavor profiling, you can put together an infinite number of flavor combinations. I am constantly on the lookout for unusual ingredients that I have never worked with before. I am fortunate enough that as I travel the world I get to experience new cultures, new foods and new bar techniques from some of the most talented professionals on Earth... this is an endless source of inspiration. PDT (Please Don't Tell), The Dead Rabbit, and Death & Co. are my usual haunts although I've recently discovered Black Tail Lounge. I like to rotate around the New York cocktail scene and see who's working and what's new. I usually avoid Sunday and Monday nights as they tend to be industry "nights off". Otherwise, I prefer Tuesdays or Wednesdays when the bars aren't quite so busy and you get a little more personal attention. When following a recipe, you MUST taste the cocktail before serving. Just like a chef who tastes his soup and makes adjustments, you must taste every cocktail for balance. When tasting, ask yourself "Is the cocktail too tart? Too sweet? Too strong? Too weak?" Then simply adjust in the right direction (using only the ingredients in the recipe) and voila! You will always have good tasting cocktails. If you use fresh ingredients and quality spirits, you'll always have great tasting cocktail! CHEERS!!! I founded the American Juice Company in 2013 to empower bartenders in bars and at home to make award winning cocktails using only real ingredients.